About half-an-hour’s drive from Kangaroo Island’s Kingscote Airport, many travellers stop to take photos of a motley crew of mailboxes that belong to the residents of Vivonne Bay. I smile, thinking that this trip to the bottom of Australia is going to surprise us in many more ways over the coming days. One third of this remote 4400 square km island is devoted to nature reserves, and with a population of only 4700, the locals have plenty of room to move. Kangaroo Island’s reputation has long intrigued me: it’s known for its wild and woolly weather and just as wild seas, its beautifully rugged landscapes, fabulous organic produce and the 1500 Aussie species that call it home: koalas, wombats, wallabies, sea lions, New Zealand fur seals, echidnas, Cape Barren geese, and the tiger and pygmy copperhead snakes. We’ve already noted the tiger snakes here are larger and more venomous than their mainland counterparts, and agree it’s a good thing I’m quite a stomper when bushwalking. And, of course, the island is known for its roos. The creatively named Kangaroo Island kangaroos are found only here, and with no natural predators, they’re the slowest-moving of the species. Closely related to the western grey kangaroo, they’re typically smaller and sturdier, with thicker, darker brown coats. Basically, they’re cuter than mainland kangaroos. 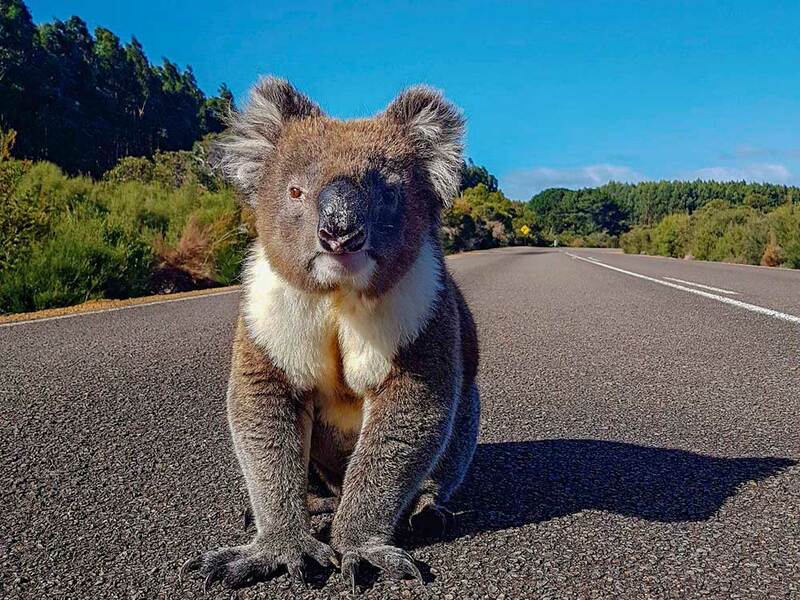 Despite its name, many people visit Kangaroo Island to see Australia’s undeniably cutest marsupial, the koala, in its natural habitat. There are tens of thousands of them living on KI, so you’re almost guaranteed to see one awake and climbing about. In the 1920s, 18 koalas were taken across to Kangaroo Island as a precaution to prevent their extinction. However, due to the lack of predators and an abundance of their favourite food – gum leaves – their number spiralled out of control. A single koala eats 200-500 grams of leaves a day, so they have literally been eating themselves out of house and home. Today, koalas have to be desexed and some relocated in order to keep the numbers under control. Hanson Bay Wildlife Sanctuary is the best place to see a sustainable population in the wild. We take some wonderful photos of koalas on the move, and of many just slouching about as they’re known to do. As native animals are in such abundance on Kangaroo Island, many visitors opt to be amongst it all in the many small lodges, hotels, cabins, caravan parks, campgrounds and private rentals dotted around the island. 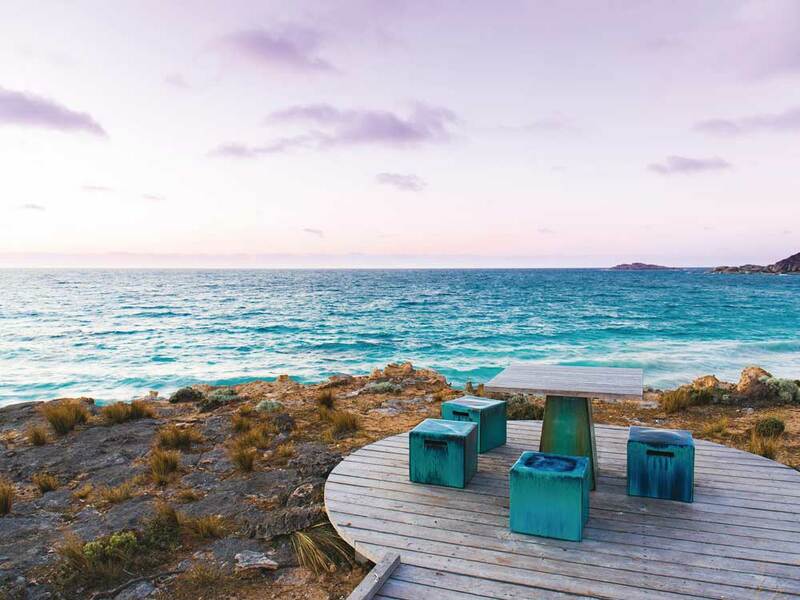 Others (like us) don’t want to miss out on the fine food, wine and other luxurious offerings of Southern Ocean Lodge, named fourth-best hotel in the world in the US’s Travel + Leisure magazine’s 2016 World’s Best Awards. Stepping through the lodge’s grand entrance at the end of a timber walkway, away from the whipping winds that have me blushing and the native shrubs dancing, there is no doubt in my mind as to why so many people talk about this place. It’s not easy to take in the 1548 square-metre architectural spectacle, which slices through the blanket of lime green native vegetation like the elegant wing of a gigantic jumbo jet, without our mouths hanging open. It’s perfect timing then, when a lady approaches us bearing flutes of champagne upon a silver platter and canapés that get us excited about the lunch to come later. Champers in hand, we are guided to lovely leather seats positioned before the astounding view – three-metre floor-to-ceiling glass windows that make us feel as though we are perched on the edge of the world. Designed by award-winning Adelaide firm Max Pritchard, the building is like a reflective mood ring. From dawn to dusk and throughout the night, it absorbs the surrounding world’s inherent energy, converting it into something that has the power to move anyone who steps into it. 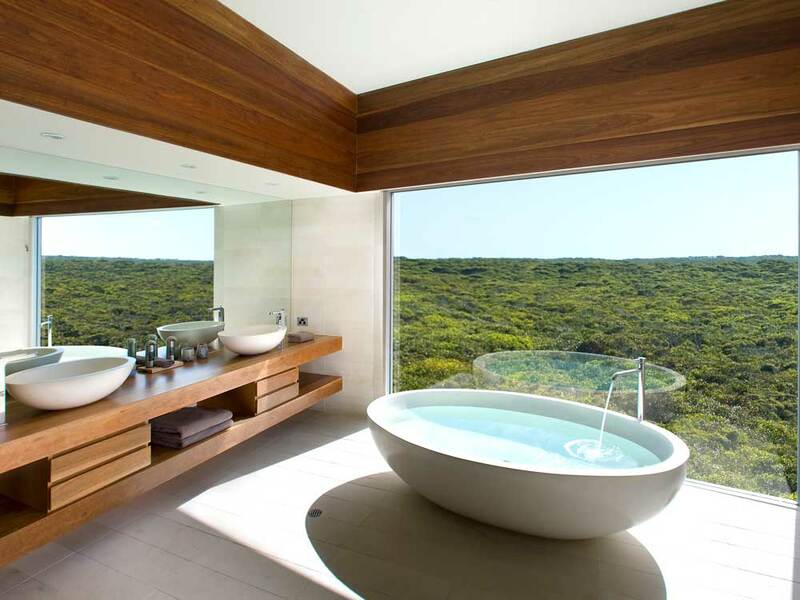 Everything, from the pale timber bespoke Khai Liew lamps and furniture to the leaf collages by local designer Janine Mackintosh, and the seats made for taking in these unbelievable views, were chosen to create an oasis where nature is always centre stage, and relaxing is the aim of the game. There are plenty of activities on the island, but it’s also perfectly acceptable (and encouraged) to slip into typical Southern Ocean Lodge life: late breakfasts followed by a leisurely activity, a three-course lunch with perfectly paired wines, perhaps another activity, afternoon canapés and après-activity drinks, followed by dinner and dessert, paired with more of those fine wines. Guests can help themselves to most of the wines in the cellar, and other topnotch tipples (think Henschke Hill of Grace, Penfolds Grange and the best Bourdeaux) available upon request. 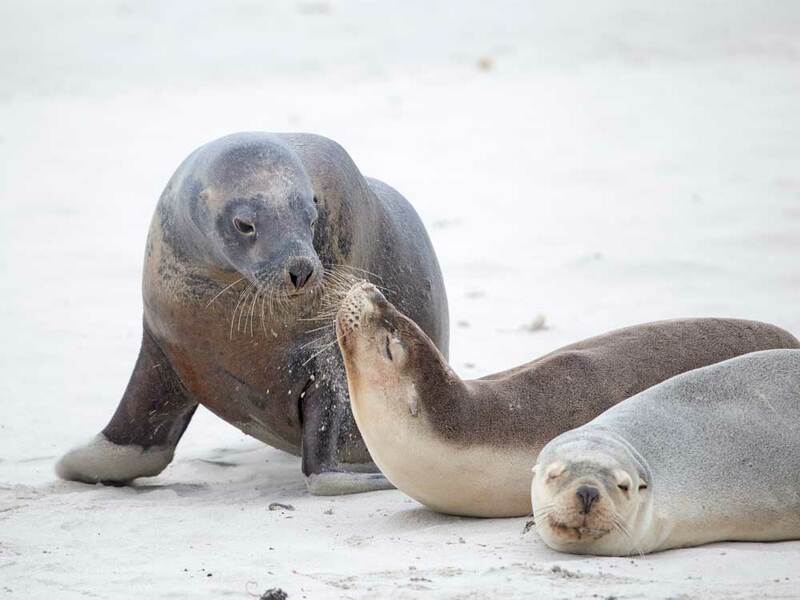 We decide upon three of Kangaroo Island’s most iconic activities during our three-day stay: visiting a sea lion colony in Seal Bay, taking in the Remarkable Rocks and venturing into the wonderful world of Admirals Arch. At Seal Bay Conservation Park you’ll find an enormous colony of sea lions. Our guide explains they’re called a raft when on the water and a rookery when breeding. We’re in luck as breeding season has passed and we arrive after nap time, when hundreds of sea lion pups are loping about after their mothers like cheeky cherub-faced cartoons. A winding wooden walkway takes visitors through scrubland that the sea lions call home, and out on to the beach where white sand, blue sky and unspoiled vistas sprawl in every direction. Life has not changed here for these creatures for thousands of years – their home is how it has always been, albeit with streams of people taking photos and smiling at their antics. There are sleeping sea lions everywhere: crashed out in the dunes, lying about on the beach, exhausted after big swims and hunting sprees in the ocean. There are plenty of warning signs about not getting too close, and for good reason – a protective bull can weigh up to 350 kilograms! You can’t visit Kangaroo Island without paying a visit to the Remarkable Rocks in Flinders Chase National Park. A stunning ensemble of boulders atop a granite dome, they’re Mother Nature’s version of Sculpture by the Sea. Formed during the post-Cambrian period around 500 million years ago, the unusually beautiful shapes and vibrant colouring were caused by rain penetrating the upper layer of the rock, decomposing it into separate boulders. The wind, waves and lichen have since worked wonders, resulting in one of the most photographed natural spectacles in South Australia. Just when you thought one remote island could not have been bestowed with more astounding natural beauty, enter Admirals Arch – a partly underground world of ancient caves where the wind, rain and waves have created a natural bridge with stalactites adorning its underside like jagged chandeliers. Designated as a significant geological monument, the site attracts thousands upon thousands of visitors a year. The New Zealand fur seals love this rocky playground’s sheltered ledges – there are usually hundreds of the creatures cavorting about. On our last evening at Southern Ocean Lodge – where we’ve made friends, fallen in love with the chef and indulged in some of South Australia’s finest wines – a storm rolls in, and we are able to experience the wild weather that this part of the world is renowned for, while warm and cosy in our luxurious suite, seated in the large window as though we’re before a stage. The ocean is spread out like a dark, tumultuous JMW Turner oil painting created with layer upon layer of heavy brush lashes. As a blood orange sunset explodes beneath the gathering black clouds, we are in complete awe of nature. We’re framed by our window looking out at the edge of the world, feeling small in comparison to the show unfolding before us, but never more alive.